My first exposure to the brilliance that is Alison Bechdel came with picking up Fun Home - the graphic novel of recent years that wins over the sort of people who tend to think that "comic books" are a little bit beneath them. The copy I got had a glowing quote from the New York Times Book Review slapped across it and it all seemed to my eyes a little bit - dunno - boring and pompous. Nonethelss I thought it seemed like a good book of the month for the Comic Forum and held my nose only to discover that - wow - yeah - actually: it's really good. Funny, sad and moving in the sort of way that you tend to get from a really good classic Sunday afternoon film. 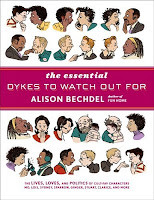 Making my way through the reviews of it afterwards lots of people mentioned that since the early 1980s Bechdel had been writing a comic book strip called Dykes To Watch Out For. With an aggressie-sounding title like that it didn't seem like the most approachable comic out there - but on the strength of Fun Home I was tempted to give it a go. There was an email sent out just before International Woman's Day that asked if anyone wanted to recommend some new "Woman-related" (or however they phrased it) stock - and I sent back a list of possible comic book titles (seeing how I am now unofficially the Comic Book Guy of Islington libraries) with Dykes To Watch Out For scrawled across the top. I don't think we got any of the books at the time - but then - last month crusing the shelves of Central Library - oh cool! (and then: wow! that's a thick book!) I grabbed it and took it back to North all ready for the Comic Forum meeting that afternoon - I stuck it on the table with all the rest of the books and tried to see if I could get anyone interested in taking it - but then - when everyone cleared out at the end - it was still sitting there - looking rather sad and forlorn. What the hey I thought - I'll give it a quick read - write something nice up on the blog and then maybe I get someone to take it out next month. Although - to tell the truth - I didn't intend to read much of it: the introduction was brand-new and written in comic book style - so that was worth a look - but as for the rest of it - well - there was that title and most of the art at the start looked a little bit too creaky and didn't want to spend all that time making my way through what - I wrongly assumed - was all going to be a bit polemical. And - god - it started in the 1980s and how much of that stuff is going to be relevant now? And I'm sure it's meant for pre-existing fans anyway - so what's the point of just reading the greatest hits? And blah blah blah blah blah. If you like comics and you like watching humans do stupid human stuff like falling in love and messing up relationships and trying to make themselves better people and whatever - then do yourself a favor and read this book because doing so will make you feel warm and happy on the inside (There's one strip that opens with an alarm clock going off and a character - with her eyes still firmly closed saying: "Urg! Not again! Didn't we just wake up yesterday?" - which is (in a nutshell) my entire philosophy on life) . It's a bit like a soap opera (this from someone that doesn't watch or like soap operas) only a lot more no nonsense (lots of things that mostly remain behind closed doors on TV aren't kept off-limits here - so check your prudishness in at the door). The thing I kept comparing to in my head when I started off was Love & Rockets - because while lots of people talk about that was being initmate and special and showing the careful development of characters over a long period time and making you feel like you bond with them like members of your family and creating effects that you can only get in a long-form comic etc - that doesn't matter - because (like I've said elsewhere) Love & Rockets is kinda rubbish and kinda dull and left this particular reader cold. While Dykes To Watch Out For does all of those things and also manages to be really funny at the same time (which I guess comes from the fact that each page was orginally meant to stand on it's own merits in a Newspaper on wherever). In fact Bechdel herself described it best as: "half op-ed column and half endless, serialized Victorian novel" and - indeed - it amazing how much it works as a potrait of it's time sorta thing as it weaves it's characters in-and-out through the end of the 20th Century and the start of the 21st with it's steady back-drop of presidents and historical events (9/11 in particular and the Bush the second's two terms get a lot of precedence - so much so that - even I (self-defineded snot-nosed liberal) found it a bit heavy-handed and was a bit "man - get over it"- but then I guess the loss of civil liberties and all the rest will do that to you). By the time I was done - it was hard to put down - and (in the tradition of reading a really really good novel) saying goodbye was like saying goodbye to my family *sniff*. 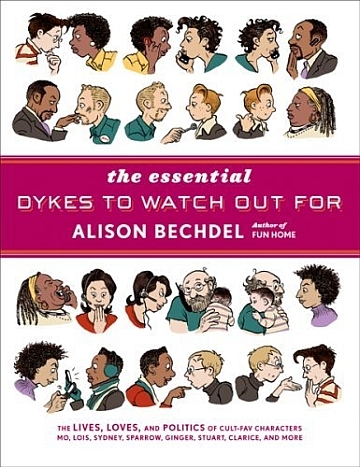 (My only small quibble is that with a title like "The Essential Dykes To Watch Out For" - would it have been too much to include the strip that first introduced the world to The Bechdel Test?) And oh - just realised this shelving books today but Mo (who is basically me if I was a woman) is a spitting image of the guy on the cover of the "For Dummies" books! Coincidence? I think not). But - basically - read this book. And damnit - I wish there was a way to acknowledge that fact without actually drawing attention to it. To be able to say: you know what? The sexual preferences of the characters in this book have absolutely nothing to do with how good or bad it is as a comic. I mean yes it's good that it increases mainstream awareness and all the rest - but just looking at it's Wikipedia page it has all this stuff about how it's "as important to new generations of lesbians as landmark novels like Rita Mae Brown’s Rubyfruit Jungle (1973) and Lisa Alther’s Kinflicks (1976) were to an earlier one" and "The strip was one of the most successful and longest-running queer comic strips" rather than just saying how good it is despite all that stuff. And not to be too soapboxy about stuff - but we're only going to advance as a culture (and all the rest) when we can stop having to mention this type of stuff ("hey read this book - but you should know - it's got Irish people in it." 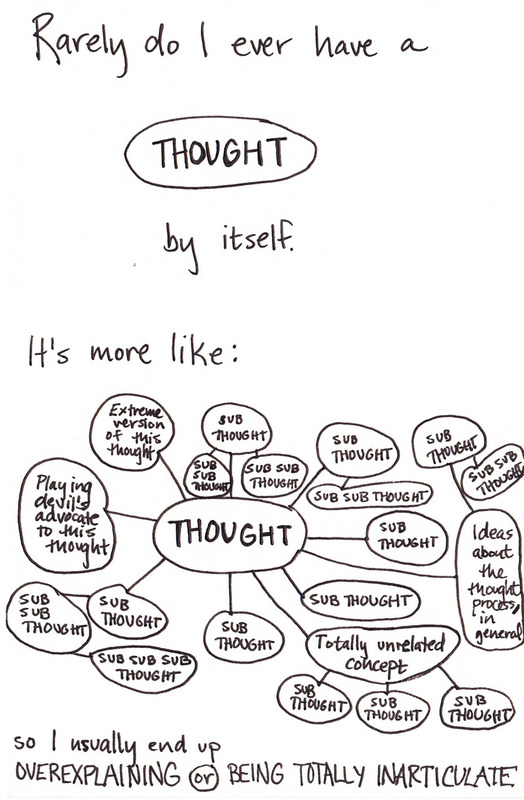 or whatever): and yeah I realise that me mentioning this is part of mentioning it - but well - yeah. *sigh* - (life is hard for me). Links: 1979 Semi-Finalist Review, Things Mean A Lot Review. Further reading: Fun Home, Are You My Mother?, Strangers in Paradise, Love and Rockets: Heartbreak Soup.